Have you seen any interesting wildlife in and around the Retreat lately? Send us your photos and a few details about when and where you spotted your bird or critter and we’ll post it here for everyone to enjoy. Wild Horses at top of our entry road on Mar 29 2018. Thanks Gary and Sarah for the Photo! Cabin owners and visitors to the James River Retreat regularly enjoy a variety of wildlife sightings but our newest neighbours have reported a wildlife encounter that is decidedly odd. 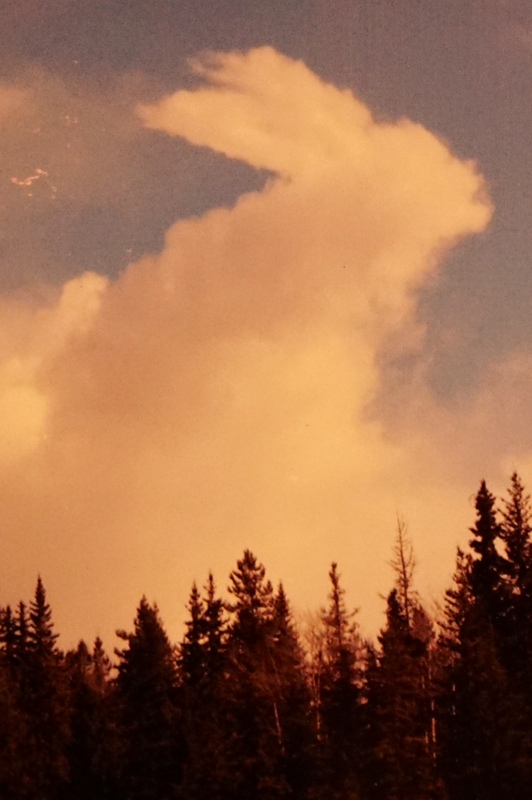 Hang out at JRR long enough and, if you’re lucky, sooner or later you’re going to see a moose. These gentle giants are frequent visitors to the Retreat, especially during the last 2 or 3 winters. 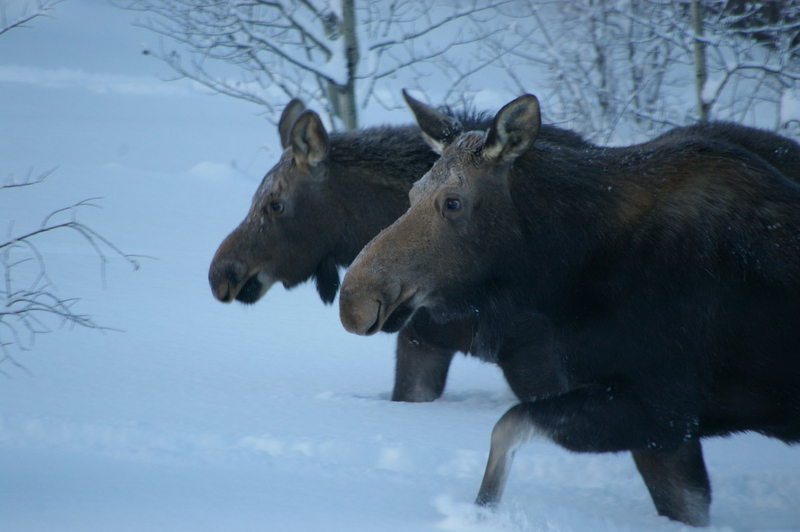 In fact, we recently received a photo of two young moose wading through deep snow outside a JRR cabin window. But Donna and Brad Grandview over on Lot 41 are relative newcomers and had never seen a moose in the wild before this spring. 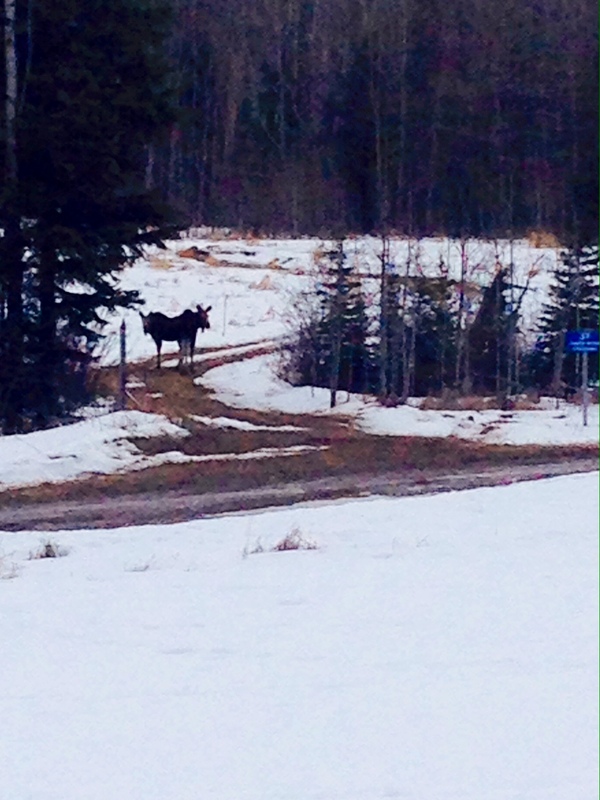 When they came face to face to face with their very first live moose, it stopped them in their tracks. “We came around a corner and saw this thing standing in our neighbour’s driveway, just a few feet away from us” reported Brad. She went on to describe how it shuffled back and forth a few times “as if it was getting ready to take off”. It took a second for it to sink in just what was so unusual about this particular moose and why it wasn’t likely going anywhere soon. “I couldn’t believe it” said Donna “so I grabbed my phone and took this photo.” No wonder it just stood and shuffled: it couldn’t make up its mind which direction to head. It’s not the first outrageous springtime animal sighting at James River Retreat (see giant Easter Bunny below) but it could be the weirdest. Any relation to Steve Martin?